Place the water, yeast and 1/4 cup olive oil in a measuring cup. Mix and let sit for 4 to 5 minutes until the yeast dissolves and mix again. Place the flour and salt in a medium mixing bowl and mix to combine. Pour the yeast mixture into a food processor and slowly add the flour. Pulse several minutes until a ball of dough forms. Remove the dough and place in a lightly oil medium mixing bowl. Cover with a damp, warm cloth and place in a warm area to rise until double in size, about 2 hours. While the dough is rising prepare the toppings. Heat the oil in a large skillet and sauté the onions and garlic about 10 minutes until translucent. Remove and set aside. Slice the olives into rounds and set aside. Preheat the oven to 450°. Punch down the dough and divide in half. Form each into a ball. Using your hands, pull the dough into an oblong bread shape about 12" long by 8" wide. Place on baking stones or pizza pans. Brush each with olive oil. 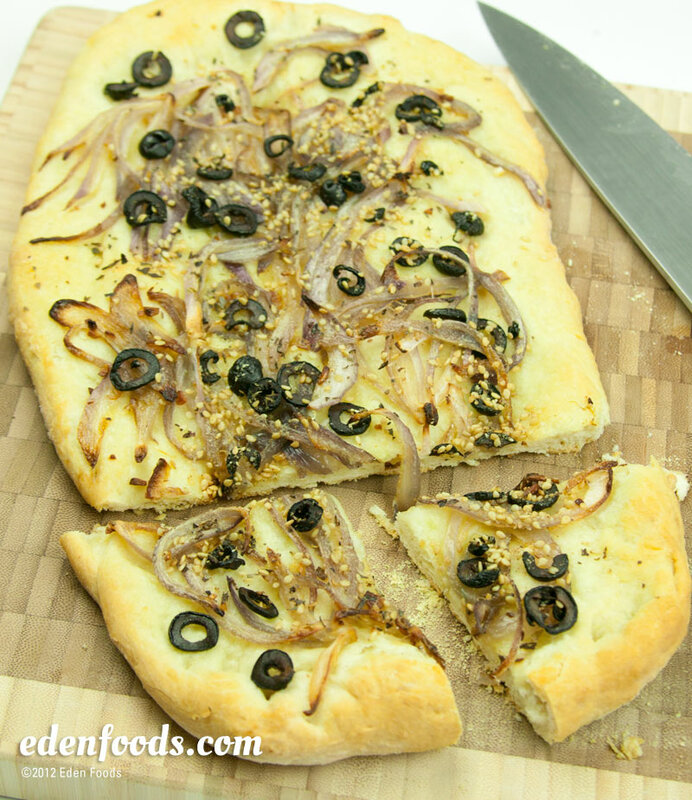 Add and equal amount of sauteed onions on top and spread over the dough. Sprinkle an equal amount of olives slices over the onions. Sprinkle half the basil, oregano, and garlic gomasio over the top of the fillings. Bake for 15 to 20 minutes until slightly golden. Remove and slice to serve.